It was my sophomore year of high school, and my friend Amy was waiting patiently for me to gather up my stuff after basketball practice so she could give me a ride home. I was moving even slower than my usual distractedly slow pace because (1) I had had a bad practice, (2) I wasn't feeling well, and (3) I was heartsick over my most recent break-up (item 3 very likely the cause of items 1 and 2). I was on the verge of tears at every turn, and Amy could tell. By the time I was ready, she and a few other teammates were standing at the bottom of the gym stairs waiting for me. "C'mon," she said, "we're going to Braum's." Everyone nodded supportively and looked my way. I realized then that they had planned this--that we had come here just for me. For a moment I got over my melancholy self and smiled really, really big. We shared the banana split, and they all talked about basketball and boys and about how much better off I was without the heartbreaker. It meant a lot that my friends were willing to put up with me and even indulge me for a little while (showing me this extra attention instead of being [understandably] annoyed with me). I have thought back to that group of friends and that banana split many times with a smile. 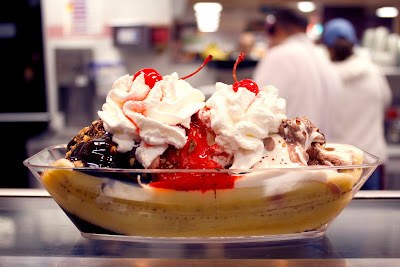 What I learned: It's really hard to be sad while you're eating a banana split--I think that's really good advice. And: Don't ask your friend what she wants to do--just do it. Tell her you are going, take her there, order for her, give her a spoon, and make her smile. If it's a bummy time for your friend, Amy's direct approach is probably right-on. If you are wanting to give comfort or cheer to someone who is struggling with something more serious, then you probably don't want to imply that a banana split can heal all wounds, because--of course--it can't. But some good ice cream and some listening time might be a step in the right direction or a bright spot in a dark time for someone that just needs to know you are there. For faraway friends, a handwritten note and a gift card or coupon to a favorite ice cream shop would be super kind. Keep a little stash and some notecards handy to put in the mail at the right time. I think I will start a stash today . . .
Yay! So glad you liked it, Gina. :) Do you miss Braum's like I do? What ice cream shops are in your area of Nebraska? you had a boyfriend in high school? next thing I am going to find out is that you had more than one. HA! You read my blog?? :) Sadly, yes, more than one, and you know that. But then I found you!